Planning can help make your road trip safe. With warmer weather and summer vacations right around the corner, you and your family may plan a summer road trip. While road trips can be fun and educational, they can pose some risks, ranging from inconvenient to downright dangerous. Planning ahead can lower the risks and keep you safe. The preparation for your summer adventure is one of the main keys to having a successful trip. If you have a solid baseline plan, you can often still have any enjoyable time no matter the challenge. You should plan your travel route before leaving. If you need maps for the trip, purchase them in advance to review and highlight the appropriate roads and exits. Plan your rest stops as well, making sure that you give yourself enough time to complete each leg of your trip as planned. Determine in advance where you will be sleeping each night and make hotel or motel reservation in advance so you don't have to try to find a place to stay every night. Ask if the establishment offers late check-in in case you get delayed en route so your room is not given to another guest. Your emergency kit should contain jumper cables, flares, tools, and a spare tire. You should also include bottled water and extra clothes just in case you have to wait for a tow truck. Another important part of your emergency kit is your cell phone. A cell phone is vital on a road trip - make sure you have a charger. Pack your car with care; in the case of an accident, suitcases and other luggage can become projectiles. Making sure that your luggage does not block your vision is also important. A car top carrier may be beneficial if you can't fit everything into the trunk. Make sure that you have enough medications for the amount of time that you are going to be on the road; extra prescription copies may also come in handy. You should also have the numbers for your pharmacy, your physician, and your insurance company just in case. If you are packing food for your trip, make sure that it is stored at an appropriate temperature. You will need an insulated cooler or two. Frozen gel packs, small plastic bags with ice cubes, or milk jugs filled with water and frozen can all be used to keep foods cold in your cooler. Travel during the day: Ttry to travel when there is sufficient light. Consider waiting for a little while if driving towards the bright light of the sunrise or sunset decreases the visibility of the road. Get rest: Make sure that you get enough sleep each night before driving. This helps you remain alert while on the road. Alternate drivers and take breaks: Driving for a long time without breaks can make you drowsy or inattentive. Taking a brief stretch break can stimulate your senses. Caffeine is only a short-term solution if you feel drowsy. If there is more than one driver in the car, you should rotate regularly to reduce fatigue. Seat belts: Wearing a seat belt can protect all members of your party if there is an accident. Make sure any child car seats in the car are installed properly. At your hotel or motel, request an interior facing room -- which is less attractive to burglars. If that is not possible, ask for an upstairs room at a motel with exterior doors. Check the locks on your hotel doors to be sure that they are in working order. You should also double check any adjourning doors and windows to make sure that they lock as well. Pick up your phone extension when you get to your room to make sure that it is in working order and that you can dial out if needed. Remember to watch your children while at your lodging site. You should keep them from wandering around unsupervised - especially near parking lots, roads, or swimming pools. Once you actually get to your destination, you still need to be aware of your surroundings so that you can remain safe and enjoy your vacation. Look like you know what you are doing: Appearing confused makes you a target for thieves. Don't advertise that you are a tourist: Leaving maps and atlases in plain view in your car alerts the criminal element to your destinations and to the fact that you are a visitor. Take your luggage into your hotel room so that it can't be stolen during the night. Get information from the local residents and local news: Watch the news or read the newspaper at each location during your trip. You can find out about the weather or interesting events that may be going on in that specific town. Asking local residents about what is going on can also help you learn new things and keep you and your family safe. 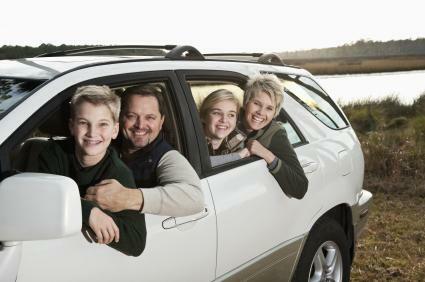 Road trips can be incredibly fun and a time for family bonding. Making sure that you have created a complete plan for your road trip before leaving is the ideal recipe for an enjoyable road trip that is safe for you and your family.